European Coaching Corner: 5- What are the characteristics of children in the 8-12 years old? 5- What are the characteristics of children in the 8-12 years old? Before starting their functions, the teacher/coach needs to know the young players who will work, from their habits through their motivations going through your body physiology and morphology. Are essential to realize that the child, although immature, are a being with a personality that are necessary to respect, and meet all its social involvement, such as family, school and the residential area where usually lives. In morphological terms, the child may be considered as a "Mosaic", which has more than 1,500 cartilage in period of growing, who will then turn in about 208 bones that we all have in adulthood, so there are some precautions to take in loads to give sessions on teaching/training. We, however, need to understand that the characteristics that are described for a certain age, not always an absolute correspondence with reality. This is because there may be different forms of expression and involvement during childhood and also because not always the chronologically age ((the number of years and days of life after birth) corresponds to the biologically age (the maturity of the body, the hormonal system, the skeleton, determined by the degree of ossification of the bony structure) of the child. 1 - A process Quantitative: The Growth, due to division and cells multiplication of the individual. 2 - A process Quantitative: The Maturation, which are the successive development of the different functions of the organism (body). The genetic development is not similar in all children. Not all reach the position of sitting at 6 months and begin to walk at 12 months, and those who do not cannot be considered a “problem”, but have their own pace of development. The growth of the child were not processed in a uniform way, but by "jumps" (Fig. 1), being the first "peak" of growth occurs between birth and entry of younger children to school (to 6/7/8 years), and the second during puberty (12/13/14 years). In each of these "peaks" of growth, there is a height increase, followed by an increase in body weight. Today it is known that there may be up to 3 years of age difference between chronological and biological age of a child. 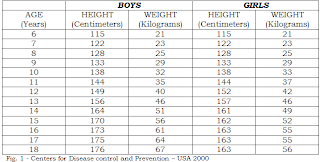 In boys are reported differences up to 3 years between biology and chronological age which leads, rarely, situations that invite to reflection. Two young players have the same chronological age (13 years) and compete in the same league. 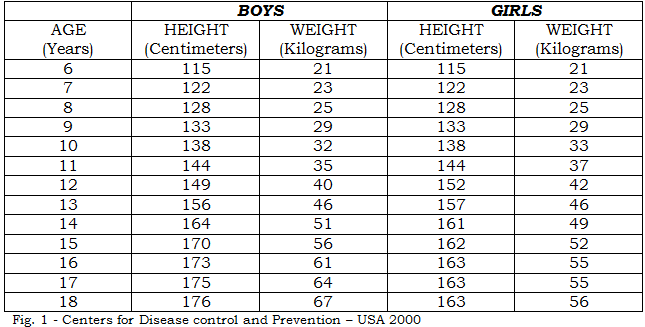 To registering, that the one of child measures 1.55m and weighs 47 kg, and the other child measures 1.90m and weighs 80 kg. What implications have these facts? Are the chronological age the factor more appropriate to group the children of the same age group? The differences between chronological and biological ages of children, has been one of the most important causes of errors produced in the detection of talents. In the selection of talent, there is still an obsession by some coaches, for players tall and strong, regardless its quality and its potential of evolution. When it comes to watch a young player that stands out in comparison with others, often the first questions that arise are, if the players are high, if have a good athletic or are strong. When it comes to a young player of low stature, but good in terms of technical, the conclusions take immediately are: "are a good player, but unfortunately are small”. As so often eliminated potential talent, because the low stature. Observation and selection of young players, the key to take into account, are the talent and not their strength or their stature, if not, players like Maradona (1.66m, Romario (1.68m), Roberto Carlos (1.68) … never have been soccer players at high level.